KATJA HAMILTON meets renowned artist James Cussen and taps into the miracle of the ordinary turned extraordinary. A hundred and 20 minutes – that’s all it takes for Plumstead resident, James Cussen to transform a 150kg block of crystal clear ice into a masterpiece. “I can do a carving from start to finish in two hours. If I’ve done it a few times already I could maybe finish it in an hour – so the process is quite quick, when compared to other mediums such as wood or stone” he said. On most days he and his partner in crime, Matthew Smyth can be found working up to 10 hours at a time in a -15 degree freezer in protective clothing – freezer suits, pants and jackets with gloves, knee guards and hearing protection. Chisels, scribes, dentist drills, angle grinders, chainsaws and blow torches are their tools of the trade. 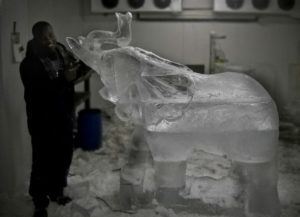 Up until now they have carved more than 1500 single ice blocks into everything from ice bars and champagne stations to intricate sculptures of people and animals. “We’re always trying to push the boundaries and are looking for new applications for using ice. We don’t have plans to take over the world but we do want to keep on being innovative and to always keep trying to be unique,” said James. 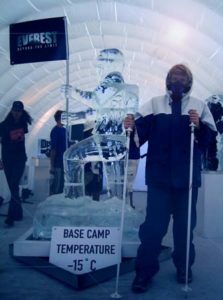 A highlight for the duo was when they were commissioned to carve a larger than life-size hiker summiting the peak of Everest for Discovery Channel. The sculpture started out as eight full blocks and weighed in at 1200kg at the start. It was displayed at the top of Signal Hill for the launch of the series Everest: Beyond the Limit. 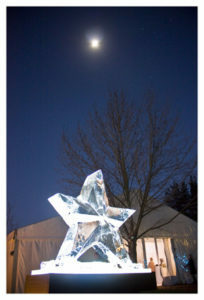 The ice sculptures have also gone a long way to raising awareness of environmental issues. Last year together with Conn Bertish from JWT, the team worked closely together with Wavescape and Light and Dark Films to produce the Ice Board Project documentary. The documentary showed the carving of an exact ice replica of the single-fin Pipeline board used in the 1970s by Gerry Lopez and other legendary greats. The project’s aim was to assist in raising funds for the Save Our Seas Foundation and to highlight the crisis in global warming. “The trickiest part of the creation of the ice sculpture was the fusing of the two halves of the board onsite at the function so that they would be strong enough to last for the event on such a thin and narrow join. The ice board surpassed all expectations and was on display for 12 hours before the join gave way!” said James. All of the meltdown was captured in a time-lapse video, which was a simple metaphor for what is a happening right now to all the world’s glaciers and ice caps. The ice board was auctioned off for R20 500. 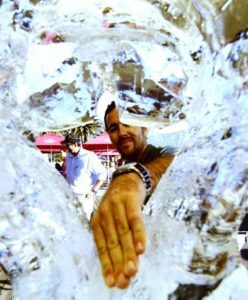 James’ biggest project to date was an ice lounge at the V&A Waterfront made from 65 tonnes of ice, a project where he collaborated with a Johannesburg company in 2006 and more recently the re-creation of the famous Ice Hotel Bar in a secret location in Cape Town for a yet to be published shoot. This re-creation used 35 tons of ice and some of the ice was shipped from Sweden. “Most people come up and touch the ice and call others to come and inspect it because they just can’t believe it’s made of ice. The snowfill details get the greatest reaction, ” says James. Mastering his skill to this point has taken James seven years to perfect. “The business in Canada and America is a massive multibillion dollar industry. You’ve got maybe 200 ice companies that have been carving commercially overseas for 40 maybe even 50 years. It’s big in the banqueting industry in Dubai and in a lot of the Filipino countries and in Thailand. The guys know how to make a swan, an eagle and a tortoise. I saw the concept in Dubai and I thought there might be an opportunity for customised hand-crafted ice sculptures in SA. “Having no experience at carving ice I imported some very basic moulds. Ice Art has since grown from a 2m x 2m freezer container in Woodstock to premises of 270m2 in Maitland which includes a 50m2 freezer. The hard work has paid off. Yet James never rests on his laurels. In addition to ice logos and branded ice, he continues to be innovative. 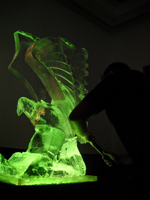 More recently he added experiential ice-carving sessions to his portfolio for private functions. 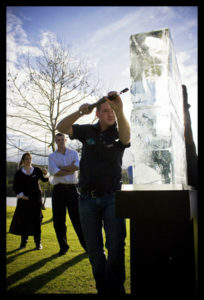 Here guests are treated to a live carving demonstration and also get to try the unique art of ice carving. 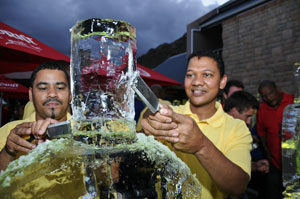 The sessions were launched at Distell in Stellenbosch where staff members were treated to a memorable ice-carving experience and had the opportunity of recreating an ice sculpture replica of the fish eagle featured on their brandy bottle. 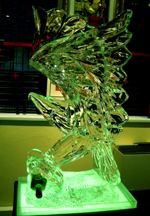 With ice logos and ice brands added to the mix, it’s no wonder that Ice Art continues to break new ground in customised art carvings. 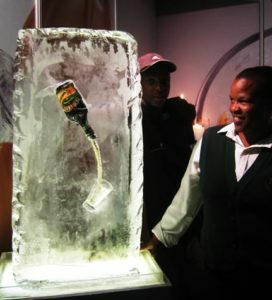 Ice Art assisted Distell and Fish Eagle Brandy in creating a memorable ice carving experience, where staff from Distell teamed up to try their hand at creating an ice sculpture replica of the Fish Eagle Brandy bottle… from a solid 150kg block of clear ice. Matthew Smyth from Ice Art first performed a live carving of the iconic Fish Eagle to show the various techniques and methods for ice carving, and how to apply them to the ice. Perfecting the skill of ice carving takes many years, however, the basics of ice sculpting were demonstrated and once his Masterpiece was completed it was the guests’ opportunity to create their own glistening ice sculpture from scratch. In teams of 5 they chipped and carved away to create their own masterpiece in ice and there was a prize giving at the end. Ice sculptures have always fascinated people, young and old, and what a unique team building exercise to work on such a unique medium and see it come to life as a complete ice carving replica. Wedding Table centrepieces have traditionally always consisted of flowers and candles, but with a fantastic centerpiece made entirely of ice, your guests are sure to be impressed. These can be customised to suit any theme, with a huge range of options to consider for your tables. 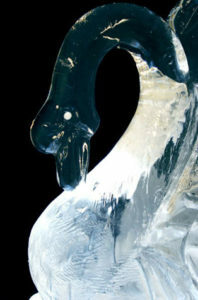 Choose something subtle like romantic heart designs, swans, cupids or anything you can imagine. A stylish yet functional option, these sculptures are perfect for your wedding reception, allowing guests to enjoy delicious fresh oysters served at icy temperatures. Plus, oyster bars made of ice add a great deal of visual impact, ensuring a sophisticated wedding reception kick-off for guests to enjoy. From spectacular ice luges all the way through to eye-catching champagne fountains serving ice cold bubbly, ice bars are a great way to get the party started. These can be customised to suit any décor or theme, and provide an elegant way to serve welcome drinks at your reception. Customised sculptures of any size can be set up at a strategic position, for a breath-taking core décor feature. Life size replicas of the bride and groom made entirely of ice bring the happy couple to life, ensuring plenty of ‘oohs’ and ‘aahs’ from your guests as they arrive at the venue to take in this amazing sight. Add a unique touch to your wedding entertainment with live carving, which allows guests to witness the rare sight of a work of art being produced by highly skilled ice artists. This is also a great way to keep guests entertained while the wedding photographs are being taken, and will allow guests to mingle and enjoy welcome drinks as they watch a fantastic show while the ice artist creates your perfect wedding ice sculpture. 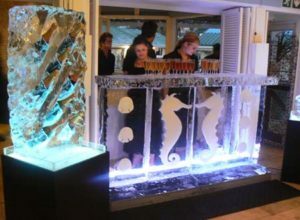 For cocktail parties of all sizes and natures, one of the best ways to ensure that the party is hot and happening is a personalised ice luge. 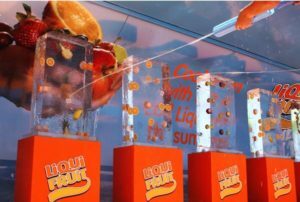 These ice sculptures have special funnels carved within the design, and when colourful liquid such as cocktails is poured into the top, the effect of the liquid running through the ice is sure to draw in the crowds. This option is ideal for informal staff parties, or even for elegant business events for senior management, with a range of personalised designs on offer to suit any event. When it comes to impressing the media, the challenge of planning an event can be even more daunting, as this target market can be extremely hard to please. 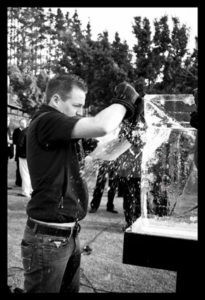 Adding a touch of fun with live ice carving is sure to get the attention of the press however, ensuring plenty of coverage for your corporate event. 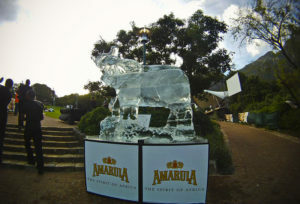 16 blocks of Ice down and 2 full days of ice carving later, the Ice Elephant was born… a magnificent ice sculpture for Amarula at the Kirstenbosch NYE concert. This Nellie, although not life size compared to a fully grown African Elephant, still weighed in at an impressive 600kg and had to moved to the location in three parts!.. 1. Base and Leg stumps . 2. Midriff and upper legs. 3. Upper back and head with trunk. The sculpture was ordered by DraftFCB Cape Town and a few days later Matthew Smyth began by welding blocks together in the 50 square meter freezer. 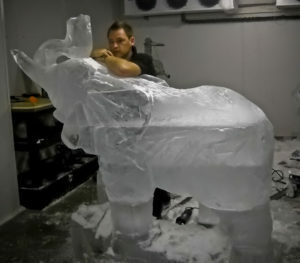 This would form the bulk of the Elephant ice sculpture…The carving was a fun experience and the elephant quickly started to take shape. The trickiest part was allowing 3 defined joins during the ice carving process, that can be separated again once the sculpture is complete… as there is very little chance of moving a 600kg ice elephant in one piece without crushing someone, or dropping the frozen beast. It took 8 fully grown, ripped men ( me included ) to remove the critical parts safely. 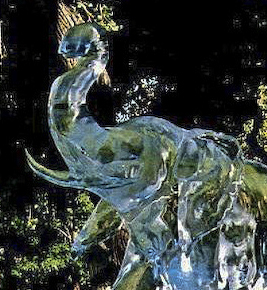 On site the elephant was re-built into his full glory and the ice sculpture was only taken down the following morning. Make sure that you have the right sort of venue to create your sculpture – a walk in freezer is ideal, otherwise any other room where you can keep the temperature as low as possible will also do. 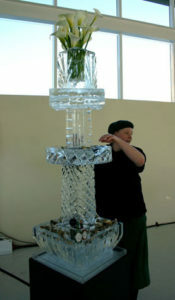 You will need to have equipment such as a chisel, knife or ice pick as well as a base with a drip tray – this is where you will start the ice carving. You will also need an ice mould or non-stick silicon baking tray for your initial design – look out for large, detailed trays that give you a clear design of a rose for instance or a boat, teddy bear or cat. Other useful things to have on hand include water, salt, food colouring and glitter to add some colour and sparkle to your sculpture. Start off by adding some salt to your water, before pouring the water and a sprinkling of glitter into your mould – you can also add a small amount of food colouring to add colour. Once the mould has set, you will be able to position it on the base and remove the mould. This should only be done when you are ready to present your sculpture so make sure that you are able to add the final quick touches before taking it out to your party guests. If you need to make any alterations, you can use your ice pick or chisel to smooth edges, and add any other details – you could also dust with a final sprinkle of glitter. Another fun way to add some special effects is to position the sculpture under some lighting to make the colour and glitter shine through the ice. Your guests are sure to give you standing ovation when you present your final completed ice sculpture!